Cannabidiol (CBD), one of the active constituents of the cannabis plant, has profound healing and balancing effects on all mammals. Pet owners have used it for a broad spectrum of medical and behavioral issues — cancer pain, arthritis, muscle spasms, seizures, neurological and digestive disorders, anxieties, obsessions, past traumas, withdrawal, mood, and memory. During recovery from illness or surgery, CBD can stimulate the appetite and speed healing. At the end of life, it can ease the pain and fear your pet may be experiencing. CBD does all this by stimulating the endocannabinoid system. demand by the body to maintain homeostasis, a stable internal environment. When these internal mechanisms lag behind the body’s needs, supplementing with extra CBD can help. Research also suggests that supplementing can coax the body to build more receptors so natural cannabinoids will work more effectively. Two types of receptors have been identified: CB1 receptors, predominantly in the brain, nervous system, glands and organs; and CB2 receptors, found mainly in the regulatory cells of the immune system. Many tissues contain both receptors, each linked to a different action. A key role of the endcannabinoid system is controlling inflammation by up-regulating or down-regulating the immune response. An overactive response can lead to allergies and autoimmune problems; an underactive one can leave the body susceptible to infections and the unchecked proliferation of cancer cells. Although hemp and marijuana are both classified as cannabis, they are distinctly different varieties. Recreational marijuana is very high in euphoria-producing THC, while hemp plants contain virtually no THC but have high levels of beneficial CBD. Hemp-derived CBD is not psychoactive and won’t make an animal high. It has no unpleasant side effects, and hemp products containing less than .3% THC are legal for sale in all 50 states. CBD from hemp is not regulated as a drug, has no known toxic level, and it is impossible to overdose. CBD is available in many convenient forms. Extracts can be given from a dropper bottle directly into the mouth, added to food, dropped on a treat, rubbed into bare skin or inside the ears, or dropped on an animal’s paw so they will lick it off. You can also find hemp CBD biscuits, hemp CBD capsules and gel caps, and topical hemp CBD ointments. atterns, give once or twice a day. Remember that you cannot overdose and there is no toxicity associated with CBD. 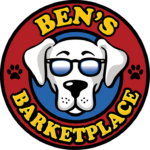 At Ben’s Barketplace we carry a wide variety of CBD products for your dog or cat.